Connecting you to the best fishing in the world! Bring along your questions and arrive on Vancouver Island ready to fish on days from May to November. I will put you in touch with local accommodation or prepare a package if that is your preference. Check with your doctor regarding your level of fitness. A waiver of responsibility will be signed prior to our taking to the field. Bring along Polaroid sunglasses, waders, wading belt, river boots, an inflatable personal flotation vest and a rain coat. A 6-weight will find use for pink salmon in the ocean and trout in rivers, an 8-weight for coho and chum in the ocean and pinks, coho, chum and steelhead in rivers. A 9-weight double-handed rod finds good use for Chinook that may range to 50 pounds. A tip-exchange system that has a floating line attached to interchangeable slime, intermediate and quick sink tips will find good use, as will a Type 4 for rainy day flows. Lines should be backed with 135 yards of 30-pound backing or 200 yards of 20-pound backing. For those with double-handed rods, an intermediate sink line will find use as will heavier tips for full rainy-day flows. An anodyzed reel with a superb disc drag will make you a happy angler with salmon and steelhead in running water. If you prefer to travel light my single- and double-handed rods, from various manufacturers, are available for use. We can talk at the time you book your outing. You can let me know if you prefer to travel by helicopter. Thus it began. By five, I had broken free. From the neighbourhood and from Calgary, Alberta. Sixteenth Avenue was little more than a tarred trail past 19th Street where we lived and I emerged to endless yellow prairie and enduring blue sky. No 24th Street, no football stadium, no Foothills Hospital, just space for me to breathe in and pass into. Before I began kindergarten, I was moving onto the land for miles, pillaging every scrap of water for frogs and bugs. And when I came to Bowness and the now-famous Bow River I could see what I needed: a rod and a Johnson Century casting reel. My life since then has always been about water. What I have found is universal experience, regardless of the province, state or even country, in which the fishing takes place. Our reasons for the pursuit of fish are our own, but we are united in an endless interest in the magic-making animals beneath our eyes in the secret water. greatest appeal. It is magic, an art form. At its most basic, this art is about killing another animal and the speeding of the heart that attends. And thus it is religion, for we must give thanks to the fish for surrendering its body for our tooth and mind to appreciate. Join me at the river. Join me with your fly and your eyes searching the braiding elements. We will go back to being kids, when summer lasts forever and every fish is a mystery and a sudden beating of the heart. Allow me to give to you my experience and make of you an expert. But, mostly, let us fish. And enjoy the beauty that is single- and double-handed casts that grace the early sun..
Want to fish for Pacific salmon anywhere on the planet? You need Maximum Salmon. It's stuffed with fish-catching info. 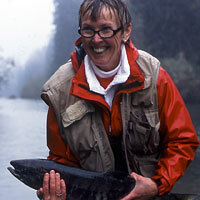 The bible for fishing Vancouver Island in salt or fresh-water; gear, fly, or Spey. Fish the big island for life with this book! Please consider making a 'tip' for the info you're reading here. There's at least a book length on fishing, gear, fly and Spey available with more being added all the time. Thanks!